Growers will receive low-cost reports to determine pathogen risks and variances in yield throughout all grow batches. Toronto, Ontario--(Newsfile Corp. - April 17, 2019) - Braingrid Limited (CSE: BGRD) ("Braingrid"), a global provider of affordable, scalable and easy-to-deploy sensor platforms for real-time data collection in Precision Agriculture, is pleased to announce that it has launched its new low-cost Data Analytics Program called Braingrid Data Intelligence. Reports generated under this program will provide growers with unprecedented conclusions on yield variances and leading indicators of pathogen risks before the actual outbreak occurs. Braingrid Plant Data Scientist Dr. Vanessa Nielsen will lead the team responsible for producing all reports to cannabis customers. Dr. Nielsen commented "Our customers have always struggled with having sufficient time and expertise to analyze the mountain of data surrounding each batch. Now we will do the heavy lifting for them by digging into their grow details to discover hidden gems of information showing comparative batch-to-batch variations." As the "mobile field lab" supplier of real-time data, Braingrid becomes a valuable information partner providing new grow foresight. 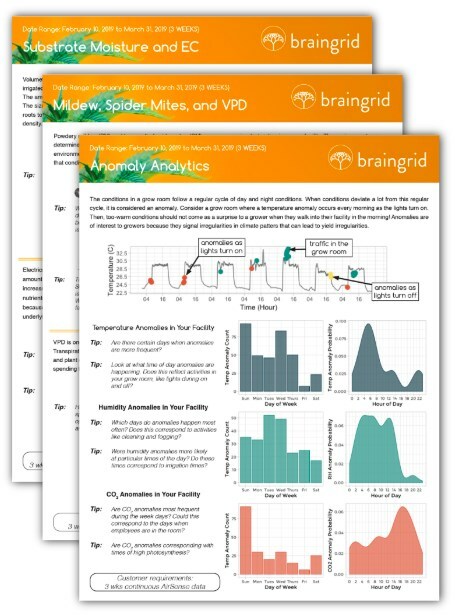 Six reports are currently available to Braingrid customers: Anomaly Analysis for Temperature, Humidity, and CO2, Powdery Mildew and Spider Mite Scores, and Vapor Pressure Deficit Chart Analytics. More reports to be announced soon. Braingrid's recent agreement with integration partner A&L Canada Laboratories Inc. ("A&L") will expand delivery of their tests such as Plant Tissue Reports to be part of Braingrid Data Intelligence. Nevin McDougall, President and Chief Commercial Officer of A&L, said: "Braingrid's new analytical reports take the science of growing to a whole new level which, when combined with our various tests to confirm pathogens or fertility issues, give the grower unprecedented depth of knowledge and foresight." The grower can then address the issue at hand and use this data in the next grow cycle for an even higher level of success. Anyone can grow a crop however A & L Canada Laboratories agronomy knowledge & testing services assists growers to achieve a higher yielding quality crop based on their specific goals. Derek Pedro, Chief Cannabis Officer at WeedMD, commented: "Braingrid has been a valuable partner to WeedMD for years. These new reports provide a quick synopsis of detailed information over a period of months and years that was never before available to us, making what we do here more effective. We really appreciate this new view of our facility operation." Early indications from new and existing Braingrid customers show overwhelming support for these new low-cost reports. The Braingrid Data Intelligence program will be showcased at the upcoming O'Cannabiz Conference & Expo in Toronto on April 25-27, 2019. Braingrid is a global technology company committed to the best interests of the precision agriculture industry for the long term. We provide valuable grow information by capturing real-time data using our technology platform to increase revenues, reduce costs, risks and improve yield - making it easier for the grower to operate efficiently and effectively. Braingrid is providing the cannabis industry with powerful technologies, now and into the future. The Company is listed on the CSE under the symbol BGRD.